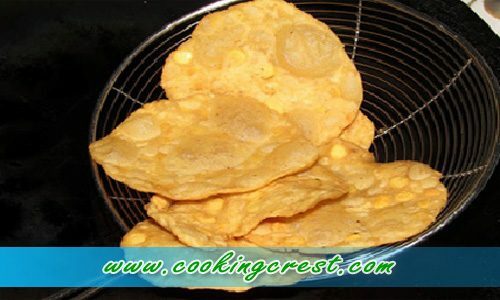 Thattai Murukku – Thattai murukku is one the traditional munchies prepared over decades. We also call it as thattai vadai. It is prepared usually during the time of festives and stored in big containers and this would be a favorite invite for the guest during the time of Diwali and Pongal festivals. This is my favorite snack/munch and my all time favorite snack because of the crunchy flavor of fried channa dal in each bite. Also this is my first try. I was waiting for long time to do this simple snack and it turned out good. Wash and soak Rice, Red chilli and Jeera for 1 and half hours exactly. Grind to the consistency of free flowing and transfer to a wide vessel. Soak the channa dal in water when the batter is half grinded. Grind the roasted gram dal. Set aside the sesame and ajwain/omam. Add the grounded powder and salt to the taken batter. Knead well and the dough becomes soft. Now add in soaked channa dal, sesame seeds, omam, butter. Again knead it for some time until soft and ingredients mixed evenly. Take an amla size and make small balls out of it. Spread a white cloth aside or even a butter sheet. Flatten it using your palm first and then spread around evenly using your fingers until thin. Meanwhile heat oil in a iron kadai and drop in the flattened thattai one by by one slowly and deep fry by flipping both sides until golden brown. Drain out the oil cool down and store in air tight containers. Adding of asafoetida is optional as it makes thattai more brown in color, so I skip. You can also apply oil in fingers while flattening the dough balls. While dropping in keep the flame low and after adding increase the flame. Make sure you press them thinner because thinner more crispy it will be.